This is where I still want to be!!! 1. Don't leave the house a mess when you leave. This means more than not leaving food or dirty dishes in the kitchen or wet laundry in the machine. This means really making the beds, picking things up, etc. This makes coming home so much nicer, like you actually are glad to be walking in the door. I have found the best way to do this is to hold the kids accountable to clean up their rooms and wake-up a little earlier the day you leave fto straighten the house. But what is extra nice is to have cleaners come in and do a good cleaning while you are gone. Save up for this if you can or if you have a teenager pet sitting, then see if they will do some cleaning for you as well for a little extra money. 2. Leave some staples in the fridge and pantry so you don't have to run out to the grocery store immediately. 3. Don't plan ANYTHING on the day after you return. I know this is easier said then done, but your kids need some down time and you need time to unpack and regroup. Believe me, you will feel much better after all the suitcases are put away and the laundry is at least half done. Wonderful words of wisdom shared by you! Have found the same to be true for our family! Our family thoroughly enjoys vacationing at a rented beach house (about an hour from home) as well. We never want to return either, even though we have a very nice home to return to! I suppose that's why "vacations" are so special! 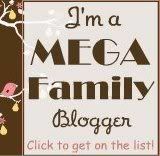 Love the new family pic at the top of your blog! Your men are so handsome and your ladies so pretty! Found your blog through another and then another. Ha. You are so inspiring. I can only imagine the fun, smiles and laughs that are in your home. your son Mattie melts my heart. Love BIG familys. I love the fullness of your family, what a blessing. Your family is beautiful. You are inspiring! Oh my goodness! I LOVE the idea of having a cleaner come in while gone on vacay! I try to leave a tidy house when we travel but with 4 kids under 5 it can be a challenge! We have two more long trips this summer(and a couple short ones) maybe we'll see about hiring someone during one of those times! I do the same thing before we leave for the mountain house. I want everything neat here since I'll have suitcases to unload when we return. You are my hero though -- having 10 kids and a clean home. I just can't find space to put everything. Scream!